Pastor Harrison was born September 10, 1956 in Alton, Illinois. He grew up in a very loving and religious family. He attended Alton public schools, before pursuing higher education at Lewis and Clark Community College, Missouri Baptist College, and finally receiving a doctorate degree from Midwest College of Theology. On August 11, 1979 he married Eddie Mae White. They have three sons. Pastor Harrison knew he had a calling on his life and he wanted to help as many as he could. 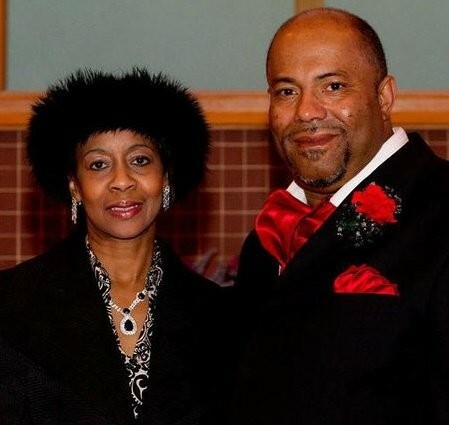 Greg along with EddieMae Harrison organized the Deliverance Temple ministries in June 1984. Many souls have been saved, encouraged and enriched through this ministry. Their focus has always been “Everybody is Somebody”. The ninth child of Aaron and Alma White, EddieMae began her life in prayer. At a very young age, she was diagnosed with the deadly disease of Sickle Cell Anemia. BUT GOD performed miraculous healing in her life. Ever since she has been committed to helping women, children and families discover their purpose and reach their highest potential in Christ. Now as a supportive wife, mother of three children and a co-pastor of Deliverance Temple Church in Alton, IL, EddieMae is an inspiration and mentor to women everywhere. Jason Harrison which known to many as "J," others as a musician, liberal giver, and still others as a beloved father, devoted husband and loyal friend. Jason was born in Alton IL, on June 11, 1983. Two of three children born to Pastors Gregory and Eddie Mae Harrison, Jason Harrison were raised alongside a diverse array of siblings. He once mused, "People shouldn’t be judged off their past but their present state of mind." Add to this skill of mediation, a strict rearing under Pentecostal tenets, and the enduring of an early prayer life; it should become increasingly clear why God called Jason into the ministry at the tender age of twenty-two. His experiences nurtured his unique call to the youth which focuses on reconciliation, educational, spiritual and natural growth. Through motivational speaking he has widen spiritual and natural parameters in order to reach diverse people of manifold backgrounds, cultures, and denominations. Jason attended Alton High School and went on to attain a Bachelors of Christian Studies in Theology from Sure Foundation Bible College and Associate of Biblical Studies from Midwest Theological Seminary. At the age of twenty-seven, Jason accepted his calling as Youth Pastor at Deliverance Temple Complex Alton, Il. Jason is still pursuing God in ALL things and hoping that everyone (Blacks, Whites, Hispanics, etc.) can join together with God’s UN judging love and Worship our Creator. Jason's greatest supporters are his lovely wife Kayla of 9 years and his 6 children Jabrea, Precious, Jay'Ion, Lakya, MayLena and Harlen. A dynamic Bible teacher, musician, and singer, Marcus serves along with his wife Shenea and 4 children Bradley, Amber, Jermiah, and Christian. Marcus has traveled the world sharing the Gospel of the Kingdom in his unique and uncompromising way. God has taken Marcus around the world to speak to youth, young adults, entire churches, conferences and camps. Marcus continues to defy description as he seamlessly integrates worship, preaching, exhortation and encouragement into one package.